Top Marines In Osprey Cover-Up? CBS News 60 Minutes Correspondent Mike Wallace reports there has apparently been a systematic effort by the Marine Corps to mislead the American public about the integrity of maintenance and safety data on the MV-22 Osprey  the aircraft in which 23 marines have died in crashes in the past ten months. The commanding officer of the Osprey Unit, Lt. Col. Fred Leberman, was relieved of his command earlier this month for his acknowledged role in the falsification of records. At the time of last week's report, it was unclear if Marine Corps officers above Col. Leberman knew what was going on. CBS News has now learned that two of the Marine's highest ranking officers apparently knew full well that data they were reporting about the Osprey were not accurate. 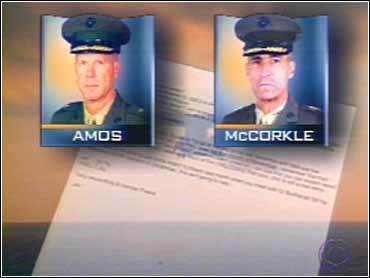 60 Minutes has obtained an email sent from Brigadier General James Amos to Lt. General Fred McCorkle, Deputy Commandant of Marine aviation. Click here to read a copy of the email sent from Brigadier General James Amos to Lt. General Fred McCorkle, Deputy Commandant of Marine aviation, last Nov. 21. In that email, dated last November 21st, Gen. Amos alerted Gen. McCorkle to the Osprey's failing "mission capable" rate  that's the number of aircraft able to fly on any given day. Those numbers Gen. Amos describes as a "bad story" and he says the information should be "close-held." In the email, Gen. Amos reports the Osprey's mission capable rate during the first part of November was 26.7 percent. That means only one in four aircraft were then able to fly. But just nine days later, Gen. Amos used different and much more favorable numbers at a Pentagon press conference. "I pulled the first 13 days of November, mission-capable rate on those airplanes, and the average is 73.2 percent," Gen. Amos said then. That would be an astonishing improvement and, according to our sources inside the Osprey squadron, impossible to believe. Speaking with CBS News, Gen. Amos acknowledged writing the email. He said he stands by all the numbers he reported and attributed any discrepancy in the numbers to a new software system the Marins are using. Why would the Marine Corps leadership distort the Osprey's performance numbers? Perhaps because the Marines need to show that at least 75 percent of the entire Osprey squadron is "mission capable" before the Pentagon will approve full production of 360 of the aircraft at a cost of nearly $30 billion. Gen. Amos said that any attack on the integrity of the Marine Corps "stings me like a hot poker to my heart."